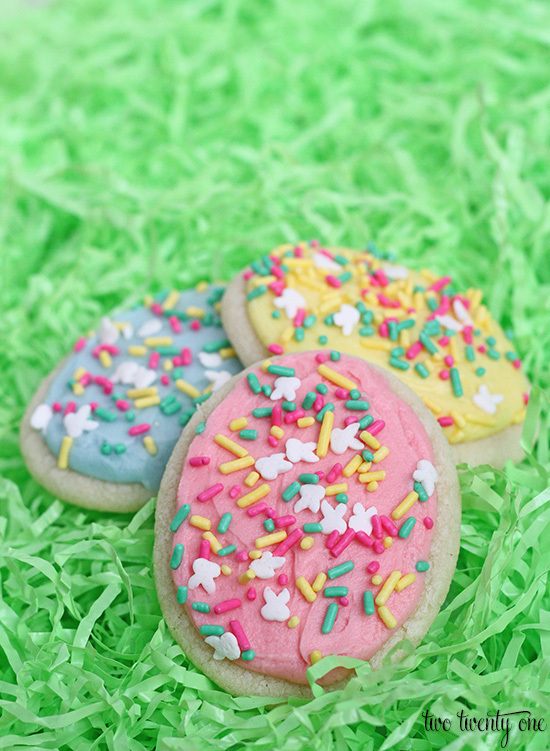 I whipped up some easy, no rolling or cutting required Easter egg sugar cookies. 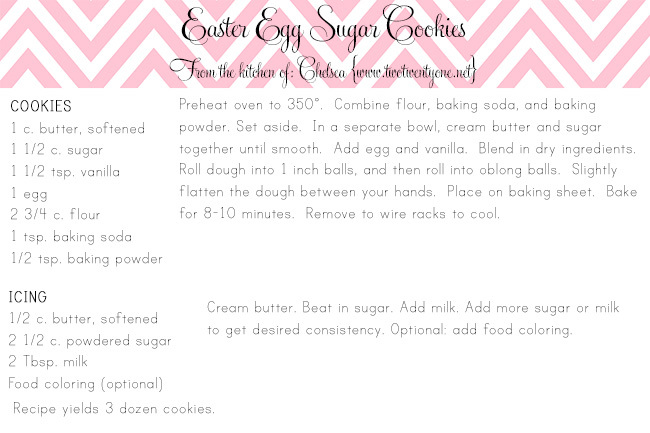 I used the same recipe for these Easter egg cookies as my Valentine’s Day cookies. But, this time I formed them into egg shapes instead of circles. Because, to be honest, I reserve the fuss of cut-out cookies for Christmas. If I can form dough into shape with my hands and save time I’m all over it. Now, here’s how I made the egg shapes. I started by using my cookie scoop to get a uniform amount of dough. I rolled the dough into a ball, and then rolled it into a more oblong ball. I squished it a little in between my hands to make it flat and set them on the cookie sheet. If you have time, I recommend making a few trial dough balls and baking them to see how they come out. Click on the image below to download the recipe card. Think you’ll whip these up for Easter? Aw, those are so cute! Love all the pastel colors. I think I have an Easter egg cookie cutter somewhere around here! These look perfect!! YUM!! And welcome to the hop (; Looking forward to lots of projects together! I love me a good sugar cookie and these look amazing! So glad you’ve joined the blog hop! Those look both adorable and tasty! Definitely need to try them! I wish it was a linky party! 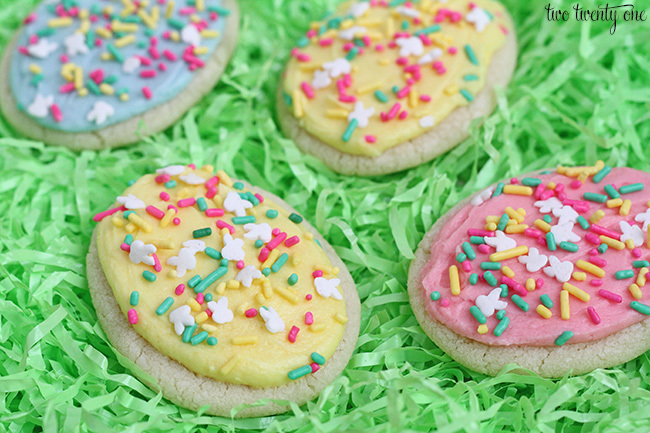 I have an edible Easter decoration post & a Cadbury mini egg cookie dough dip recipe! These look great girl. These are too cute! I made something similar to these with my daughter last year. That’s a super cute idea.. I have to bring cookies for weston’s preschool easter party, so these will be perfect! Chelsea, those look so cute and delicious! Nice to ‘meet’ you and so happy to have you in our little blog hop! These look so delicious, pinned! I love a good sugar cookie and these look delicious! Welcome to the hop! Frosted sugar cookies are seriously my favorite thing ever, and these look fabulous! Welcome to the hop…we’re so glad you’re with us!! Moreover, the six yard attire suits and complements the Indian figure like no other attire. spend so much money on designer wears. I loved as muxh as you’ll receive carried out right here. My kids, especially my youngest daughter, loves sugar cookies. It’s so fun to decorate and one of the easier ‘fancy’ cookies to make. Thanks for sharing on Merry Monday. Super cute and perfect for Easter! Your cookies look delicious! I have been looking for a recipe to make with my toddler. I think he will love to add the sprinkles on top. These are so cute! I love how you made them the shape of an egg instead of the usual round shape of a cookie. Creative idea! Thanks for linking up with the Delicious Dishes Recipe party!